Artificial Intelligence (AI) chatbots have become a broad technology initiative for many organizations. 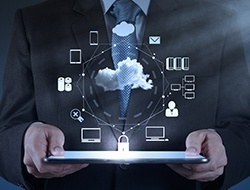 The emerging platform has unlimited potential for business applications as it can analyze information from various sources to create efficiencies, improve processes and increase revenue—all with limited human intervention. While some organizations have implemented externally facing chatbots as a new way to interact with customers, the technology can be integrated into HCM and ERP systems to facilitate vast internal business applications as well. For example, by integrating with HR systems, chatbot apps can offer employees another quick way to review their benefits, timesheets, vacation, holidays, payroll and other HR information. This not only can enable employees to get answers more quickly and during non-business hours, but also alleviate HR staff from having to respond, retrieve and communicate the information, making them more efficient. 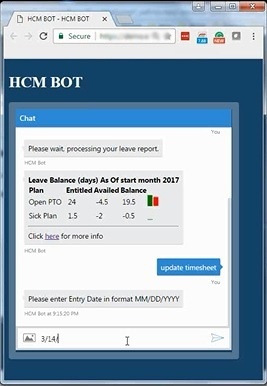 Emtec has built a prototype chatbot app that works with the Oracle HCM Cloud, and can be configured to be used with other HCM apps as well. The chatbot appears as an icon on a user’s home page within the system, using the inherent security configured in the application. 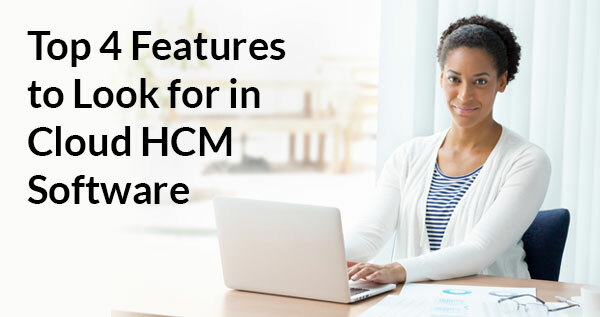 When the user clicks on the icon, a messaging tab opens with a text box that greets the user by their login credentials for the HCM application. This custom chatbot app also can be integrated with other common messaging applications that a business currently uses, such as Skype, Facebook, Kik, Telegram slack or other social chat platforms. Users then enter questions or keywords related to their HR inquiry into the message box. On the back end, the chatbot converts the user’s input into commands and begins executing them by retrieving the required data and leveraging the AI capability. On the front end, the user receives an immediate reply from the chatbot that says it is processing their request and, within seconds, gets another response with the information. When users are finished with their questions, they are prompted to logout of the icon, which clears their inquiry history. HCM chatbots can be further customized to become an invaluable tool for HR departments. For example, they can be enhanced to prompt users with frequently asked HR questions or topics when opened, or remind users of required tasks they have yet to complete, such as timesheets, benefits enrollment or registering for other internal HR initiatives, such as health and wellness programs. They also can be configured to enable employees to complete such tasks during a messaging session. With further integrations, chatbots also can be customized to enable users to quickly receive detailed information from third-party applications, such as ADP, SAP or various 401(k) vendors’ systems. Chatbots also can be mobile-enabled to offer employees access to this information while they are on the go. 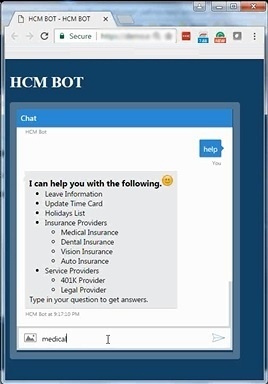 Emtec’s HCM bot already has been enabled with a help button on the message box, which prompts the user to type or click ‘help’ to get a display of tasks the chatbot can do. It also can be voice enabled. Chatbots also have other internal business possibilities that go beyond HCM. They can be integrated into ERP and CRM systems to offer employees a similar app where they can quickly get the financial and sales information they need for their business decisions. For example, sales and marketing staff can use chatbots to pull information about their top customers from a CRM application to help plan future campaigns or strategies. And executives can use chatbots to quickly receive financial information when planning presentations, approving budgets or purchases or during a meeting. The possibilities for internal chatbot apps are endless. If your organization is interested in building chatbots to help streamline processes and create operational efficiencies, Emtec’s prototype chatbot can help. Contact us to find out how.